EDC Board president Gilbert Enriquez said in a June Facebook video that the economic incentives the previous board approved for the company left taxpayers vulnerable and at risk for a combined $15 million the EDC dished out to help get the company off the ground. The company has struggled to become fully operational, and to this day it is not. 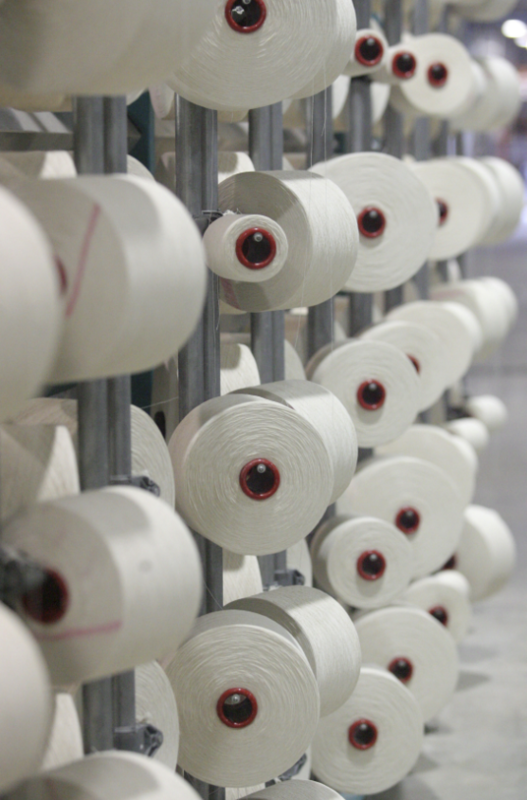 Though it is currently spinning cotton into denim, only 50 percent of its capacity has been installed. Santana Textiles — which began doing business as Denimburg in 2016 as a marketing gimmick and a nod to the city — is operating at 20 percent of its initial expected capacity and has not come close to the amount of employees it promised to hire. But perhaps most worrisome to the board, it appears to also have fallen behind on payments to the EDC. Santana staff disputed the claims during an interview Friday, but did not delve into specific financial information. “I’m not on the finance side, but as far as I understand, yeah,” operations manager Claudio J. Motta said when asked if the company was on track with payments to the EDC. Instead, Motta said he remained confident in the company’s ability to stay afloat, saying it recently switched its focus from selling commodity products to Mexico to instead selling high-end products to U.S.-based companies like Eddie Bauer and Calvin Klein. The change in vision, coupled with President Trump’s new ‘Made in America’ approach and his international trade policies, have breathed new life into the company. Santana Textiles is part of a larger Brazilian company called Grupo Santana. The family-owned business owns five other plants: four in Brazil and one in Argentina. Mesmerized by the denim-making process, he soon began to manufacture and sell locally in Brazil before turning his attention to the outside world. In 2008, Edinburg became its focus. 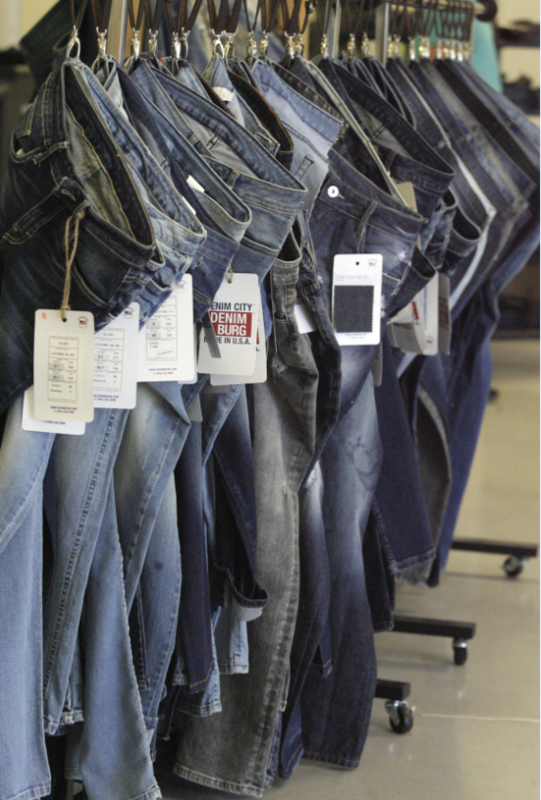 The company approached the EDC with a plan to invest $100 million to build a denim-manufacturing plant. Once operational, it would hire 800 employees and yield 1 million cubic meters of fabric per month. “It was a good business deal,” Enriquez said. So in order to lure the potential investment, the EDC offered a $5 million loan and 33 acres of land in the city’s North Industrial Park to build the 280,000 square-foot facility. Santana went through a number of setbacks and did not meet its expectations, forcing it at one point to return more than $800,000 it received in economic incentives from the state through the Texas Enterprise Fund. According to Monitor archives, the price of cotton peaked at $2.29 per pound as compared to the current price of about 88 cents. In 2015, the company once again approached the EDC for help. Despite being routinely behind on payments, the EDC board at the time approved the $10 million loan. At the time, Santana had only paid down about half-a-million dollars of the original $5 million loan it received. The company was nowhere near its capacity and employed a fraction of the hires it promised. Along the way, the board also essentially gave up the only leverage it had: the company’s lien. 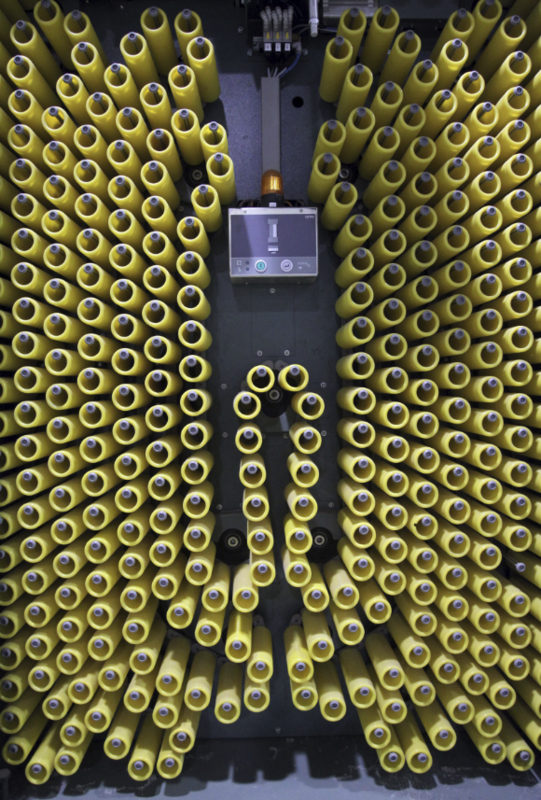 Today, the company employs 72 workers and has made a total investment of about $50 million. 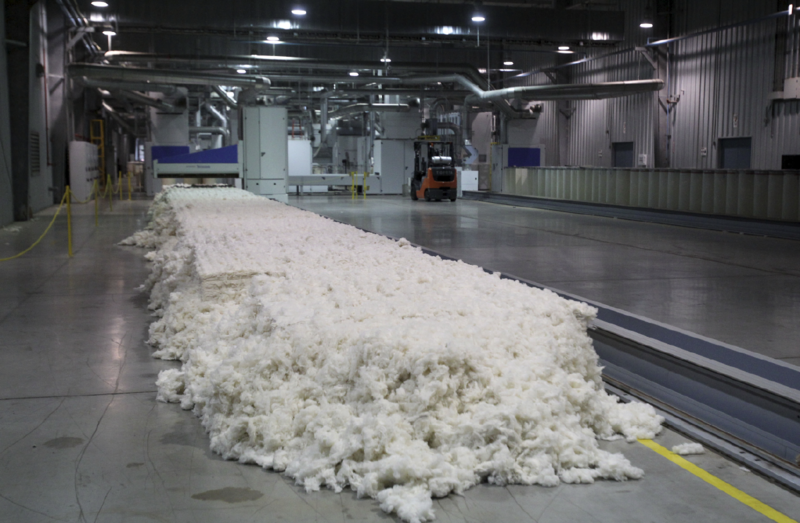 It takes about 20 days for cotton to be cleaned, spun, woven and turned into fabric, and last month, the massive and highly-sophisticated machinery churned out about 100,000 cubic meters of denim. Motta said the company will produce 200,000 meters this month and hopes to be at 500,000, or 50 percent capacity, by year’s end. The president’s ‘Made in America’ campaign has helped the company find a clientele hungry for U.S.-based goods, and Denimburg is one of two denim-manufacturing plants in the U.S. A third plant was designed to produce denim, but it is currently producing socks and other cotton products. 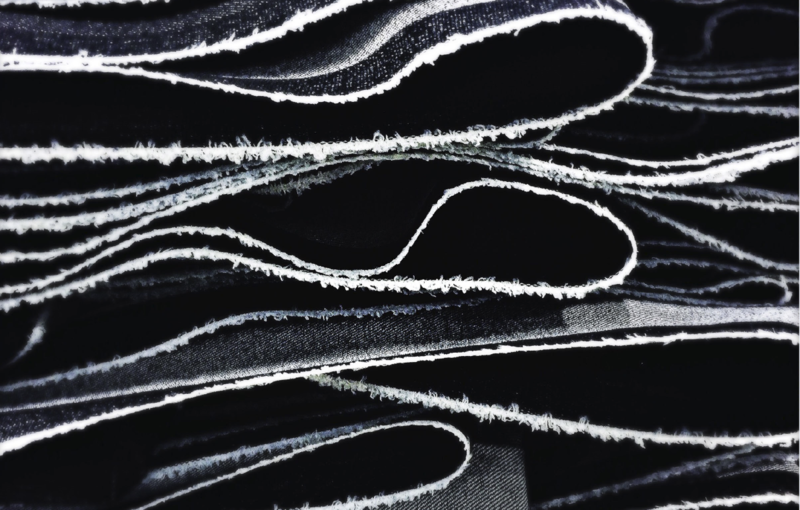 Most of the denim-producing companies moved overseas in the early 90s, pursuing cheaper labor. Today, about 90 percent of denim comes from outside the U.S. The company purchases cotton locally and from other parts of Texas. The company names its products to remind clients it was manufactured in America, using names such as Brownsville, Kingsville and Washington for various types of denim. But selling it can be time-consuming and costly. Denimburg staff began negotiating with Calvin Klein in September and didn’t receive its first order from the fashion industry titan until February. Part of the five-month wait stems from the process of developing the material to the client’s exact specifications, which include texture, color and finishing touches. Once the company tinkers with the formula, samples are sent out, often times to Europe and Mexico, and they are either given a green-light or sent back for adjustments. “As you can tell, these guys are bustin’ their hump to make sure we are meeting our customers’ demands,” Salinas said. The human resources director said the company is currently in the process of hiring more workers and expects to have 100 employees in the coming weeks. “We are going to continue to surpass all the bad stuff we had in the past and we’re going to keep moving forward,” Salinas said. And as far as the EDC is concerned, the company declined to address the animosity.